A Gantt chart displays the project-related activities. The text part on the left usually shows the individual activities as well as the corresponding start date, end date and duration in tabular form in columns. In the graphic part on the right, horizontal bars visualize the duration, start date and end date of each activity proportionally on a time axis. The longer the bar, the longer the activity takes. The requirement for the creation of a Gantt chart is an already defined work breakdown structure. All summary activities and activities must be known and named and must be arranged in a logical and chronological order. They are then entered into the Gantt chart in this order and can then be further edited in the project. You must also know in advance the working time calendar on which the Gantt chart is to be based. Working and non-working times determine how long the individual activities and thus the project as a whole will take. Of course, it makes a difference whether the working week has 35 or 60 hours, whether the resource works the day or night shift and whether Saturday counts as a working day. The number of public holidays and holidays in the project plan also influence the duration of the project. In addition, there are time constraints that determine the position of a bar in the bar chart. Some tasks have to start or finish on a certain day. "No earlier than" and "no later than" constraints are very common. For example, if a customer presentation is scheduled for a particular day, then preparations should be completed no later than that day. 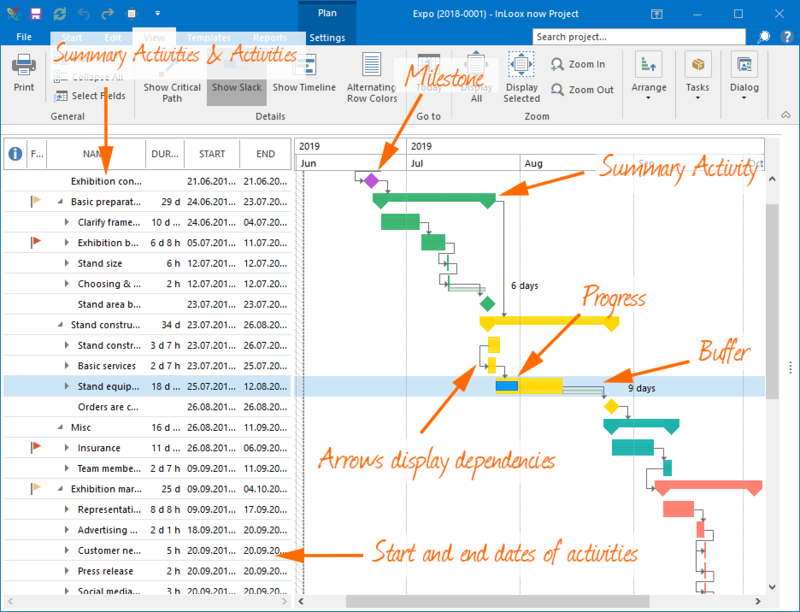 A Gantt chart displays both logical and temporal dependencies between activities. Therefore, you should also include dependencies when creating the Gantt chart, e.g. with the classic end-start relationship. Example: As soon as the graphic designer has completed the print file, it can be transferred to the printer. If, however, the completion of the print file is delayed, the transfer of the file would automatically be postponed in the case of a logical relationship. A fixed date, on the other hand, would have to be corrected manually. What is a Gantt chart? • Copyright 1999-2019 © InLoox, Inc. All rights reserved.